Our service projects got put on the backburner during the last few weeks of my pregnancy…and then again after we lost baby Chase. Knowing that I would not have a full maternity leave to spend with my kids like I’d originally thought, I decided we needed to do at least one service project while I was still home from work. As I was reading about how to hepl the kids deal with the loss of Chase, I came across something that compared death of an infant to unopened flowers. Since it is spring time, I thought – flowers! 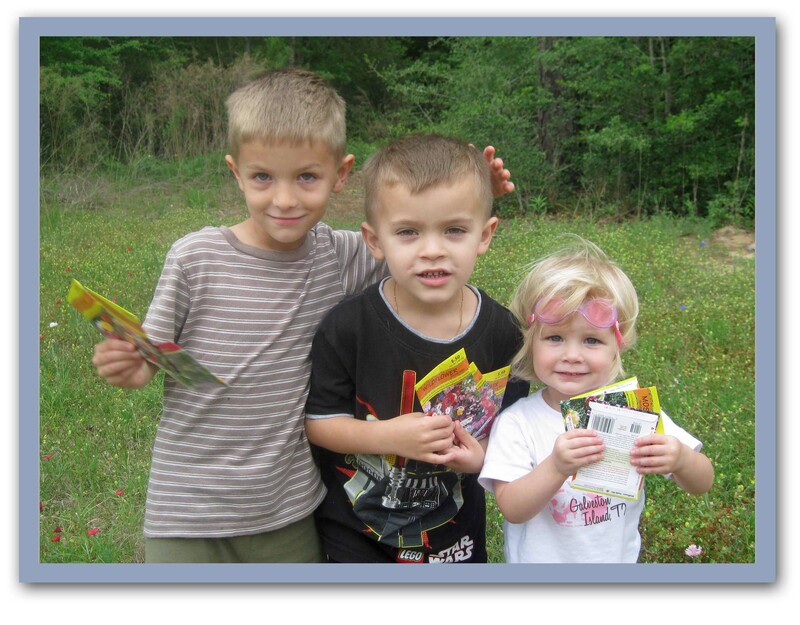 So we went to WalMart and I let the kids pick out packets of wildflower seeds. They loved picking out their favorite colors – and we even wound up buying some basil seeds to try our hand at growing the plant at home. Just across the street from WalMart is a long stretch of road where the wildflowers bloom every year. 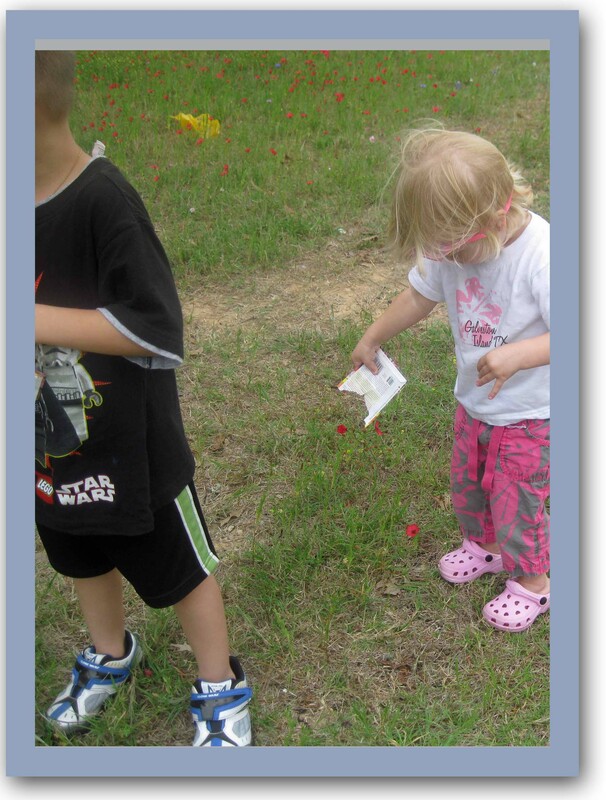 I parked the car on the side of the road, then the kids and I got out to toss around our seeds. I told them that we were not only helping to beautify the roadside, but every year when the flowers bloomed, we could remember and think of Chase. They really loved that – smiles all around. 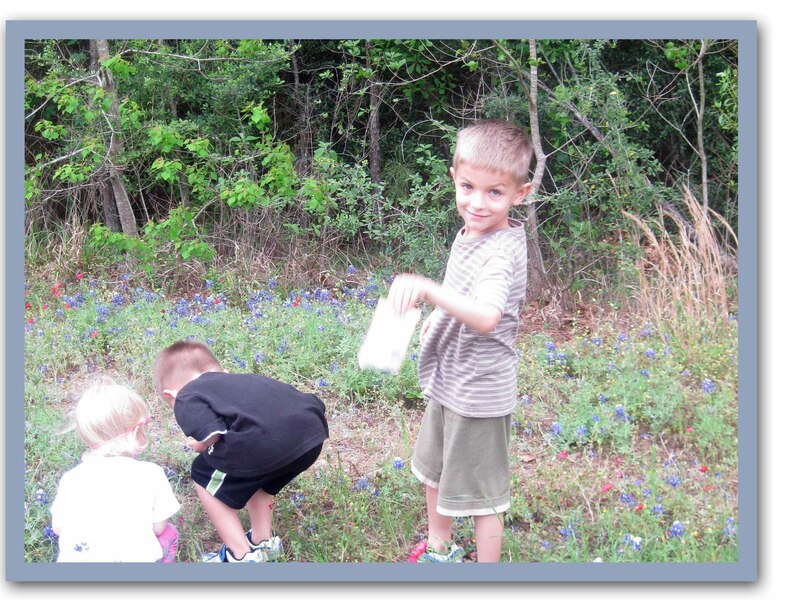 Here are some photos of our seeds for Chase project. 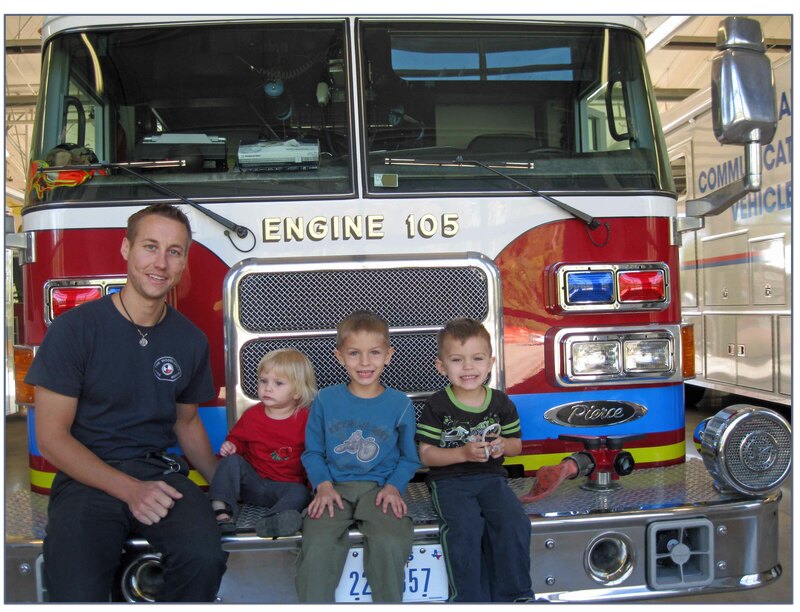 Cookies…firetrucks…yes, this was their favorite service project to date! Tyler asked all week last week when we were going to take the cookies to the firemen! I read a lot of posts online about delivering home baked goods to firehouses, and many moms said that their local fire station could not accept them. So I called our fire department in The Woodlands, and the response was hilarious, “Oh, yes, ma’am, they’d love cookies from home! Our firemen will eat anything!” It was so cute. I do have to admit this project was also a little self-serving…see, my oldest had the wonderful opportunity of fundraising for his school by selling cookie dough. And his great-grandmother saw to it that he got all the prizes offered when she bought one of every kind! 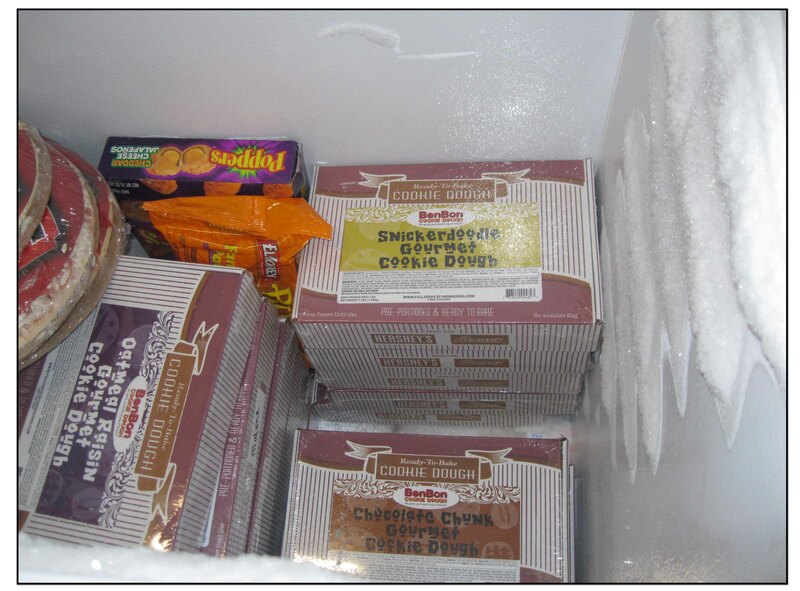 My freezer was stocked full, so I was all to happy to share some with the firemen. 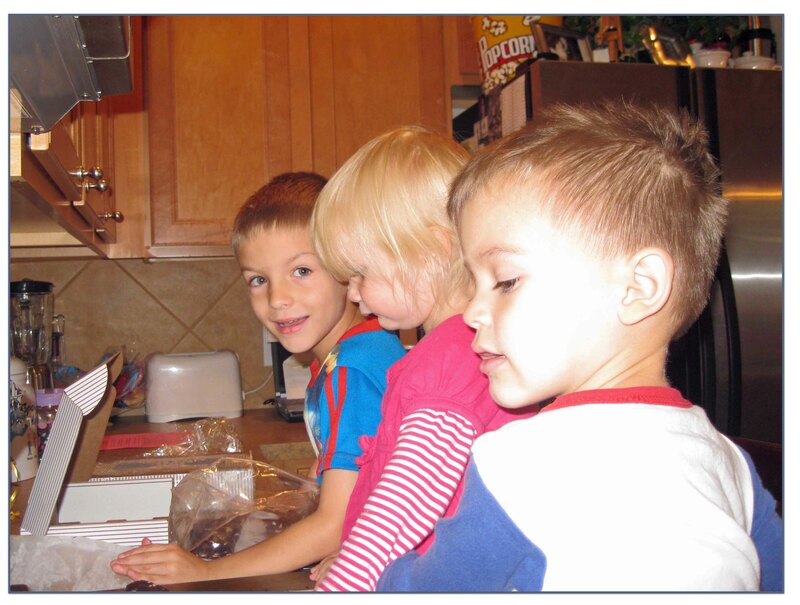 The boys, and even Madi helped me stack the “homemade” cookies on the cookie sheet for baking. They also made up some cards to tell the firemen thank you for their hard work. When we delivered the cookies to Fire Station 5, the guys geniunely loved the cards, were so kind, and so grateful. My hats off to the firemen at the Branch Crossing station house! 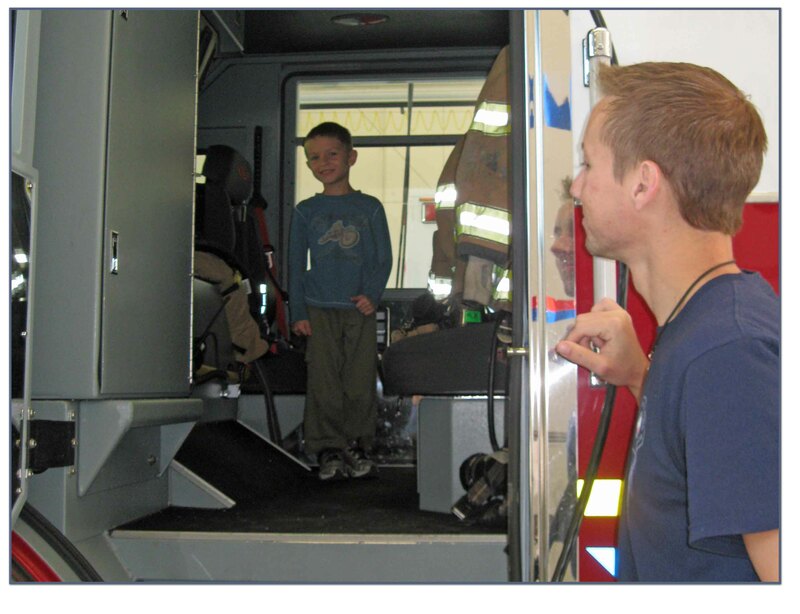 The kids got a tour, which I didn’t expect, and only Cole was brave enough to get in the truck. There had been a fire the night before, and Cole exclaimed, “It smells like hot dogs in here!” Everyone chuckled at how cute that was. It was a great visit, and the boys even told someone how we’d had a great weekend because we took cookies to the firemen for our service project. 4 weeks and counting! With two boys who can make just about anything into a gun (sticks, pens, I’ve even seen one do it with the little cross he made in Sunday School), helping out our troops was a blast. I found an organization online called Soldier’s Angels, and you can send in care package items that will be sent overseas to soldiers. To personalize the activity, I printed some coloring pages and let the kids go to town on them. My hope is that Soldier’s Angels will include them in their packages to let the troops know they are thought of in The Woodlands, Texas. 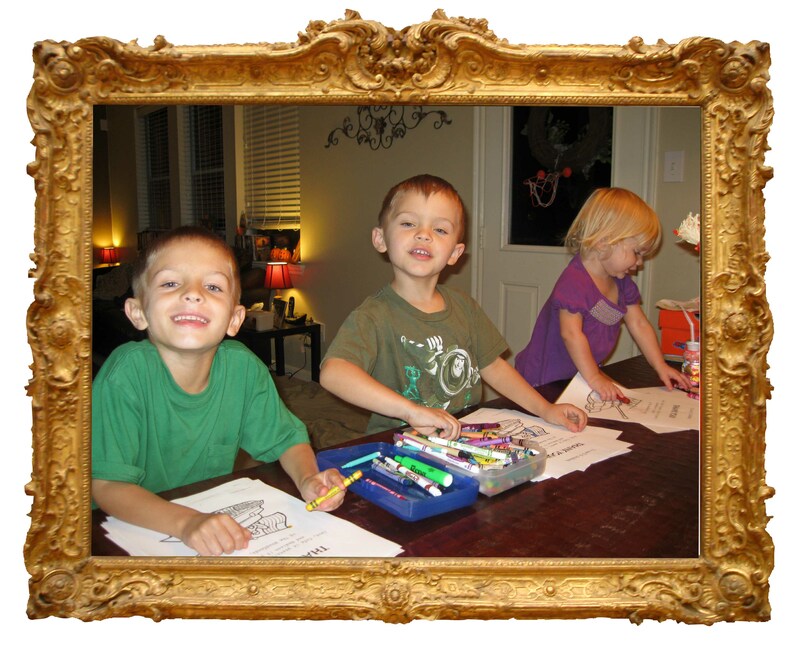 All three of the kids loved coloring the pictures, Tyler especially liked the ones with the “tank” on it. One of the pages had the U.S. seal on it, and Cole asked why the president’s seal was on it. Great question – and I mixed in a little government education with our service project. 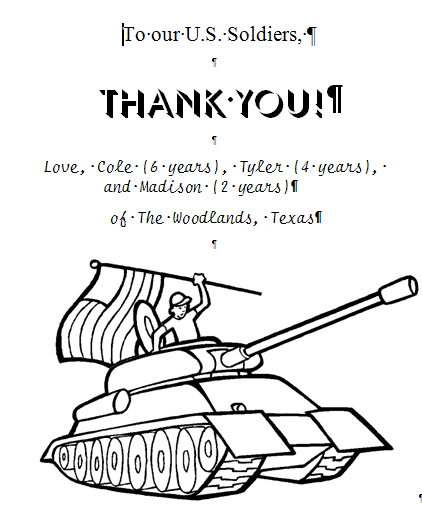 The boys asked what the soldiers would do with the pictures, and I explained that hopefully it would make them smile. They liked that answer. While Madison was still in pre-school, I took the boys to the store to buy the care package items. 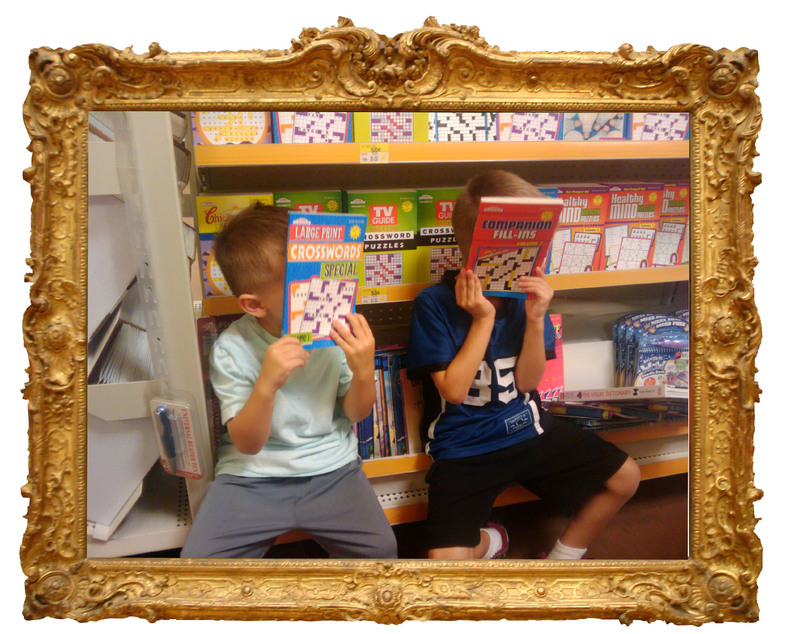 They got a little shy and decided to hide behind the crossword puzzles they picked out. And though it did not take long at all to get the items we sent (and not much money either), they acted exhausted riding in the back of the cart. 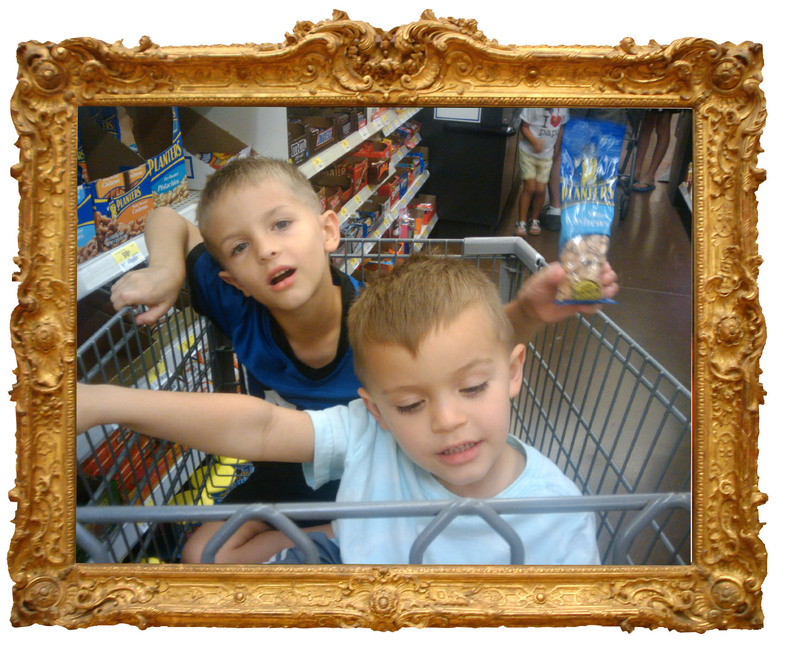 But aren’t they cute, even when they are acting like shopping is such an exhausting chore (men in the making, for sure). We got home, and I joined us up with Soldier’s Angels. A few days later, after I’d found an empty box, we packed our items in a box. I explained to the kids how we’d mail them to the troops. 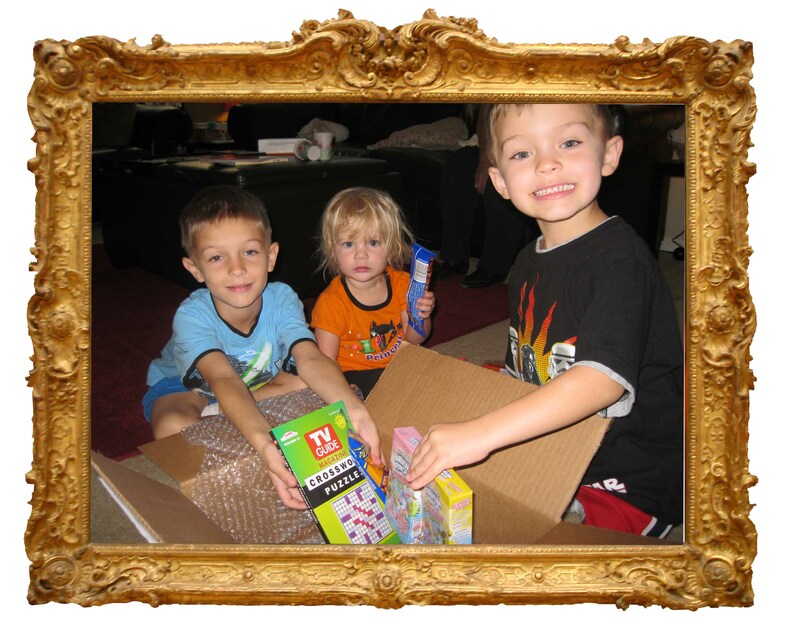 They were really excited, and I was amazed at how Tyler placed everything in the package so neatly. He seemed to enjoy this project the most. Until next time!